It’s all good man, I’m having a good time. The last two weeks I’ve been riding really good—actually, I feel like I’ve been riding good all year. The Yamaha really worked well tonight, I don’t know what it was, besides, I think we’re all happy. So we’re gonna’ take a little weekend off and try to continue the momentum next weekend in Salt Lake City. I love that place. I knew the track was going to be tough tonight. It kind of separates you a bit, and it was fun. The ruts were just super deep, and it’s so rutty, once you got stuck in a rut, you had to just stay with it, and that made it tricky with the lappers, it was up to me to get around. I was happy, I was able to get about a ten second lead early and manage the race from there, and I was able to do it. I want to give it up to the team, San Manuel Red Bull Yamaha and everybody, thanks for the support, and I think I’m going to go to the Bahamas with my family and have some fun there for Easter, and we’ll come back after this break and try to come out swinging at Salt Lake. Back to back wins for Stewart. It definitely did not start out good. I don’t know, I was just struggling in qualifying and the heat race and I was really not happy. I don’t know if it was rust from not racing or what. I was kind of powered by that anger, you could say. I came back here and just got on this spin bike and just ran it as hard as I could. I was in here taking it out on that spin bike. I even ran down to the tunnel. I started maybe seventh, and once I got around some guys and got free I started to find my groove. I was able to make up pretty good time and I got past Tickle to get into second. I’m a little bit closer in points now with two races so maybe this helps me get in their heads a bit. The track was definitely tough, I would say it was even harder than San Diego even though we didn’t have rain here. The race was decent. I got a good start and just tried to adjust to the pace and find somegood lines. I felt like it was coming together. It took me three of four laps to find the lines, and then I started kind of matching Stew’s lap times. I felt good, I felt comfortable, and I started marching away from K-Dub. All good until two laps to go. I just made a small mistake, didn’t get onto the table. I don’t know if I cross rutted or not, but yeah, I just drove right in. It was pretty gnarly, at that point I just tried to tuck and roll and pray that bike wasn’t gonna’ get me. It was pretty friendly, but it roughed me up a little bit. So I was like “What the hell did I do?” I had to get up, I was a little rattled to be honest with you, I kind of rang my bell, my chest was sore, the bike was bent up, levers, and RV was there, so I was like “alright we need to still make this happen.” He tried to make a last-lap pass there, it was fairly aggressive but nothing I wouldn’t have done. You know, it’s fair game, so yeah, I came out on the better end of the stick. Happy to be on the podium, especially after that, bummed to lose two points from what I had when I was in second. A late mistake would cost Reed second, but he managed to hold off RV for third. I was pretty happy with it. I really have to thank the team, we did a lot of work over the break, a lot of outdoor riding and a lot of work on starts and it’s starting to come around. I felt comfortable in these track conditions and had a good heat race. I had a decent start in the main and it was really tough, a lot of us were together battling and you had to be careful. Yeah, I did have a little fall there, and that’s six out of seven races this year where I have gone down. But I think I recovered okay. I’m really looking forward to the next two races and especially Vegas because I seem to do well there. I’m just trying to keep building and keep putting myself in good positions to do well. I just can’t seem to get off of that gate. I don’t understand what’s going on, because when I was younger I used to be holeshot king. I was a little bit tight out there, but not too bad, we haven’t raced for awhile but it’s not like we ever stopped training during the break. I just need to get those starts and get this Rockstar Suzuki team up there, we really need it and everyone has been working so hard, they deserve it. I think it was a good night for our guys. Andrew got caught up in the first turn with Stroupe, and he got hit and has a pretty good bruise on his thigh. He was almost last and he came through to tenth which was pretty good. And Mike had a good race, he was up there in the beginning. We made a change during the week and I think it really helped Andrew’s attitude coming into the race. Mike, we know he is concentrating on outdoors, but I told him he should concentrate on doing good in supercross while he is racing supercross. Because normally the riders who do good in supercross do good outdoors. I have been telling him that but I think maybe now he’s starting to follow that. 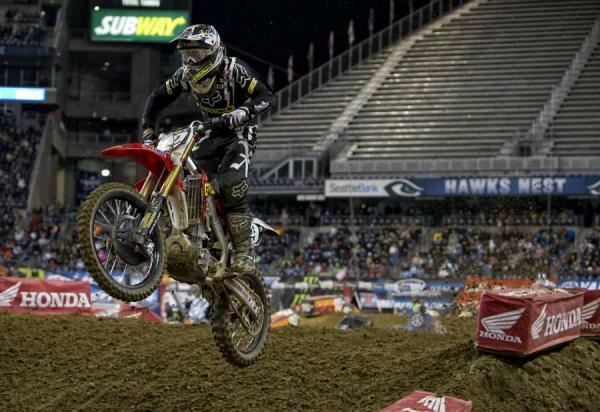 Tomac charged to a second place finish in Seattle. The night went ok, we came in here and you never know what to expect from Seattle. The weather was nice, the track was soft. 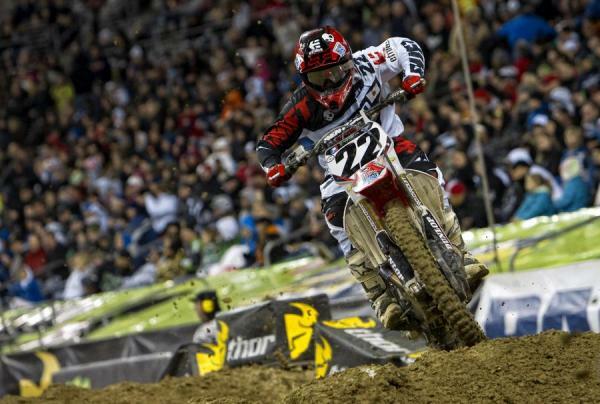 First off, Seely rode a fantastic race and we were hoping for (Kyle) Cunningham to do well, he had a great practice. He was running well but had a tip-over in a turn. He got back up and got some positions back. He did ok.
Nick Paluzzi was doing well, unfortunately he was getting lapped and had a collision with one of those guys and went down in a turn near the end of the race. He lost some spots right there. The night was ok, would’ve been nice to see Kyle do better, he’s riding well. We have to keep him up there in the top five so hopefully he’ll be in the running for the championship next year. The track was so difficult. I think it was a little bit like last year because I saw it on TV. But it’s like Daytona where you see it on TV but then you ride it and it’s completely different! I tried to stay focused and not crash, it was easy to make a mistake out there. I finished thirteenth here in my last race in United States. My goal here was to get a top ten but eleventh was the best I could do. I didn’t get injured and that was the deal with the team so I’m happy. I think I take a little bit of a vacation! (laughs) I will go race some outdoors in Spain for a sponsor and I’ll race some supercrosses in Germany, in France-wherever. 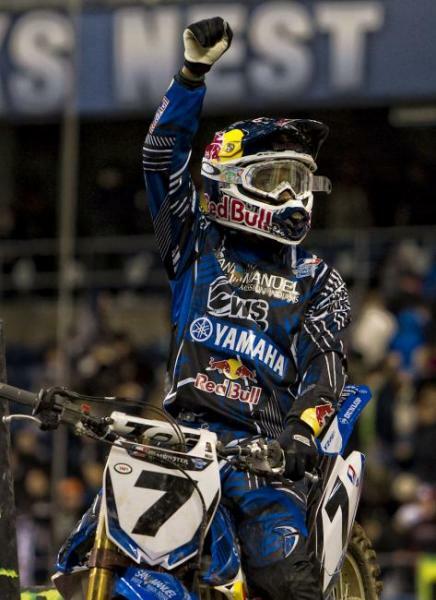 The whole experience was great, the bike and being a teammate with Ryan (Villopoto). I will never forget it the rest of my life. I’d like to come back and race the first six races next year like I did last year. I would like to say thanks to everyone, it was a great, great moment for me. I stayed for two months alone but these guys are like my US family. I’m so, so happy. I had a great relationship withy everyone. Everyone on the team worked for me, there was no difference between Ryan and me with those guys and I can’t say enough thanks to everyone. The night was good. We got some points and headed in the right direction. We got a couple of podiums and are headed in the right direction. Unfortunately we lost (Jimmy) DeCotis tonight but sounds like he’ll be alright. What do you attribute Kevin’s great ride to? The track suited his style tonight; it’s one of those tracks where the hanging it out thing wasn’t in favor. KW’s smooth calculated style really worked well tonight. 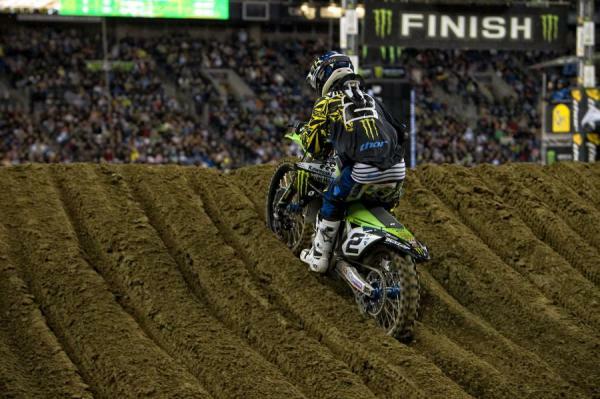 Villopoto lost a few points to Stewart and Reed, but his points lead remains steady at five. Yeah, it was a good night. Chad went down and we did one more lap and then the white flag came out. It got really exciting there on the far side. He wasn’t going real fast and I was able to get up alongside him. We both shot for that inside rut there and we hooked up. I basically pushed him outside the rut. I did something weird in the rut and almost crashed as well. It was a bummer and it was a last ditch effort to get in there and get those extra points. The track was rough and the ruts were really deep. One triple was crazy, we were dragging the footpegs up the face and I came up short a couple of times. So you extended the points lead tonight in a way tonight. I lost some points, I gained a pojnt- whatever. I want to get another win before the season is over and try to win this thing. Whoever wins it-it’s going to be huge. It was definitely brutal. It was actually scary. I don’t think there was any other word for it. Last year I felt like it was ok if you hit your points out there but this year, it was scary out there. I thought last year was a little sandier. Lack of riding for me makes a difference, I don’t think my set-up was right tonight. Basically I’m here for gate time for outdoors, I’ve been riding outdoors at home and I’m testing this week outdoors and I’m really looking forward to that.